Since its maiden flight, Dec. 11, 1986, The U.S. Air Force considers the F-15E Strike Eagle to be one of the most proficient multi-role, air-to-air and air-to-ground strike fighters active today. On its 30th anniversary, after flying thousands of missions during worldwide combat operations, the aging F-15E is still relevant and capable of supporting current combatant commander’s requirements. The F-15E was designed as a fighter and bomber aircraft with a back seat for a second crew member to operate a ground attack weapons delivery system. The cockpit contains the latest advanced avionics, controls and displays. 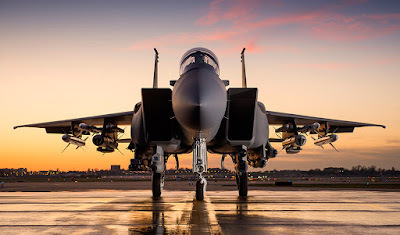 The redesigned airframe was built with a stronger structure allowing heavier takeoff weights and doubled the original F-15 Eagle’s service life. 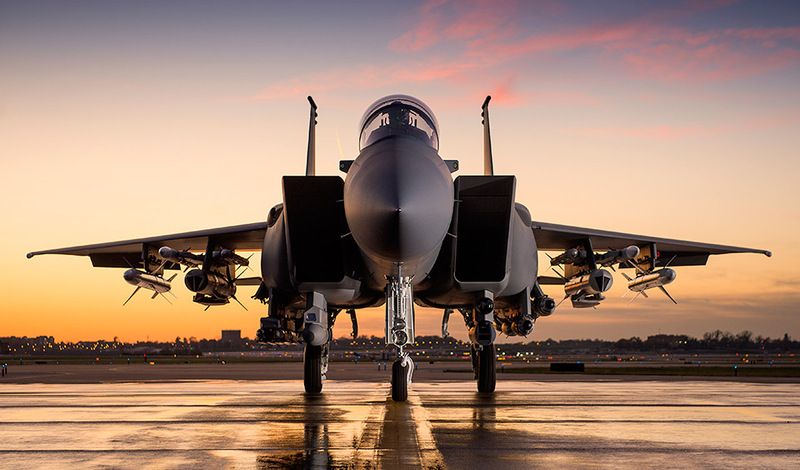 Advanced technology and avionics assist the F-15E to fly day or night at low altitudes and in all weather conditions. The jet can also carry nearly every air-to-ground weapon in the Air Force arsenal, including AIM-7F/M Sparrows, AIM-9M Sidewinders and AIM-120 advanced medium range air-to-air missiles. 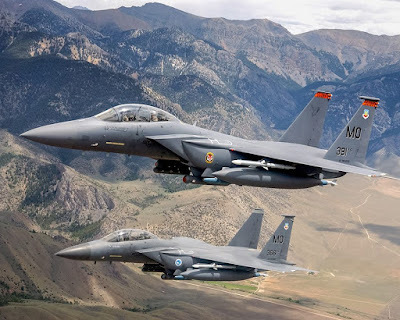 "The way the F-15E is built is a huge reason why it's such a respected and capable aircraft," said Maj. Michael Jokhy, 335th Fighter Squadron assistant director of operations. “The F-15E Strike Eagle can hold a lot more gas and weapons than other multi-role aircraft in our inventory." The extra fuel allows the Strike Eagle to stay where it's needed longer, providing more life-saving close-air-support. Additionally, Jokhy said the extra weapons the Strike Eagle can carry are a great safeguard and reminds the enemies of the U.S. who has the world's most dominant airpower. During OPERATION DESERT STORM in the early 1990s, an F-15E from the then 335th Tactical Fighter Squadron at Seymour Johnson Air Force Base, North Carolina, destroyed an Iraqi Mi-24 Hind helicopter with a laser-guided bomb. The F-15E also flew into enemy territory multiple times while under heavy anti-aircraft artillery fire and demolished Scud missile sites proving its air-to-air and air-to-surface capabilities. The F-15E was the only fighter able to attack ground targets around the clock, in all weather conditions during the 1990s Balkan conflict. The U.S. Air Force currently has 219 F-15E Strike Eagle aircraft, mainly utilized for close air support during operations. According to the Department of Defense, as of Dec. 2, 2016, U.S. and coalition aircraft have conducted more than 16,592 strikes in Iraq and Syria in support of OPERATION INHERENT RESOLVE. Additionally, the Strike Eagle has contributed to destroying or damaging, over 31,900 targets as part of OIR, further degrading and defeating the Islamic State of Iraq and the Levant. The 335th and 336th Fighter Squadrons and maintenance units frequently deploy to areas of responsibility in Southwest Asia to aid with the DOD's lines of effort which include, providing military support to our partners, impeding the flow of foreign fighters, stopping ISIL's finanacing and funding and exposing ISIL's true nature. During the 335th Fighter Squadron's most recent deployment, F-15E Strike Eagle pilots and weapons systems officers flew more than 9,250 combat hours, dropped more than 2,000 bombs and killed more than 80 high-value ISIL individuals. To further enhance the already devastating capability of the F-15E Strike Eagle, the jets at Seymour Johnson are currently receiving upgrades through Boeing Co.'s Radar Modernization Program. The old legacy APG-70 mechanically-scanned radar is being replaced with a new active electronically-scanned radar system, APG-82. It’s designed to retain functionality of the old legacy radar system while providing expanded mission employment capabilities. Col. Christopher Sage, 4th Fighter Wing commander, believes the F-15E is an imperative part to the Air Force mission and the future of combat air power.